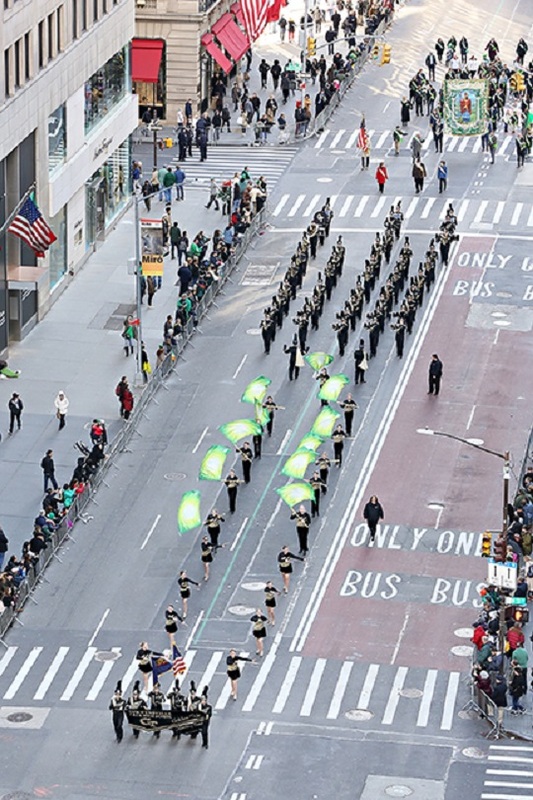 NEW YORK CITY – A local high school marching band was part of a grand Irish celebration Saturday in New York City. The Curwensville Golden Tide Marching Band marched in the 258th St. Patrick’s Day Parade. It’s the world’s oldest and largest civic parade and celebrates the faith of Ireland, Irish heritage and culture. It marches in honor of St. Patrick, the Patron Saint of Ireland and of the Archdiocese of New York. It’s normally held March 17, unless it falls on a Sunday. Then, it’s moved to Saturday because of religious observances. The parade steps off on 44th Street and proceeds up Fifth Avenue to 79th street in Manhattan. It marched for the first time in 1762, 14 years before the Declaration of Independence was signed in Independence Hall in Philadelphia. The parade is regarded as the most popular of all the parades in New York City. It consists only of marchers and each year hosts some 250,000 marchers and two million spectators. The parade has many marching bands, bagpipers in marching formations, high-school and college bands from throughout the United States and from all over the world.